The drivers who provide services for HELP’s transportation program have as many stories as they have relationships with their riders. One of the drivers smiles as he remembers 102 year old Mary, who was always delighted about the ride to her hair appointment. Even with her walker, double hearing aids and near blindness she rarely missed her chance to chat with the driver and other riders. 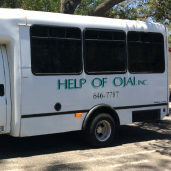 HELP’s transportation makes it possible for seniors and the disabled to continue to do their errands and socialize. HELP’s drivers say the primary reason they drive is the relationships they build with riders and the chance to do something meaningful. Many realize they are offering a service they may need as they get older. There is always a need for people willing and able to drive vans for the wheelchair bound. Training is provided and the emotional reward is priceless. For more information or to make a ride reservation please call Tina Rosas, Transportation Director at 805-646-5122 ext. 105.